Are you looking for that perfect party to ring in the new year? 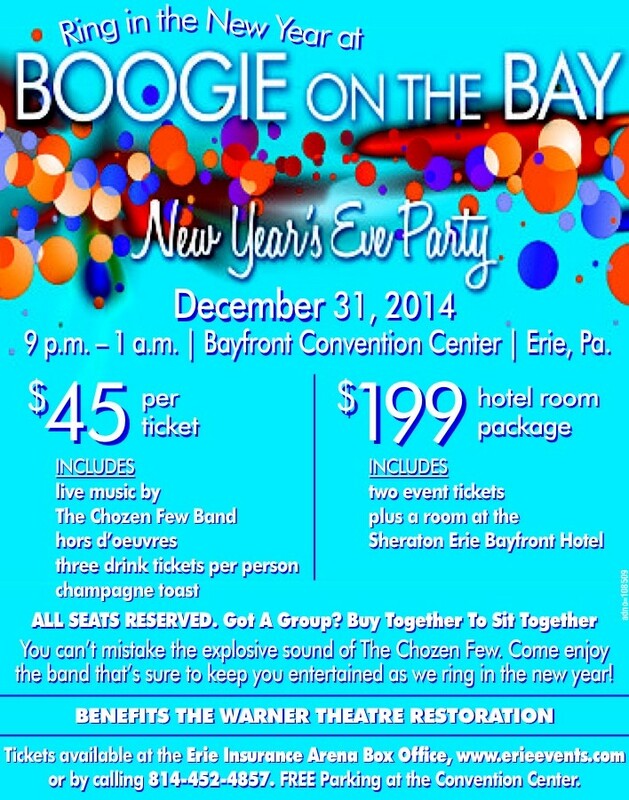 Look no further because the Bayfront Convention Center is offering a great package for everyone to celebrate 2015! For $45/ticket, you’ll enjoy live music by “The Chozen Few Band”, hors d’oeuvres, three drink tickets per person and a champagne toast. For just $199, you can spend the night at the Sheraton Erie Bayfront Hotel, the #1 rated Sheraton in Guest Loyalty in North America for 2012 and 2013, plus two event tickets. This New Year’s Eve celebration benefits the Warner Theatre Restoration. All seats for the event are reserved, so buy your tickets together to sit together. You don’t want to miss the best party in town! Tickets are available at the Erie Insurance Arena Box Office, http://www.erieevents.com or by calling 814-452-4857. Also enjoy free parking at the Convention Center NYE.